Casino chips are unique to each and every casino. This is even true of casinos that belong to a same group of companies. Casino chips are distinguished from one casino to another for one further reason which is that all casino chips are obliged to reflect the amount of money in the casino cashiers. Furthermore casino chips from one casino are not allowed to be used in other casinos except in the State of Nevada. There are a vast number of different security features available. First of all the artwork applied to casino chips these days are of very high photographic quality and high resolution. It is normal that each particular casino uses their own combination of colours to make their casino chips. Certain casino chips include UV designs included in the inlay. Furthermore, there is a widespread use of RFID technology that incorporate microchips into the individual casino chips. On the whole, counterfeit casino chips are a rarity in most casinos worldwide. This is due to a number of elements. Firstly there are very high surveillance levels put in place throughout casinos together with the fact that staff members are taught to identify and recognise all features of casino chips specific to individual casinos so that they may spot counterfeit casino chips if they encounter them. Most US states require all casinos to have available a set of casino chips in reserve with a different set of markings. 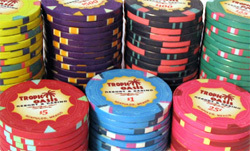 Tournament casino chips are usually different from normal casino chips as they carry no cash value. They are therefore more simple in design and cheaper to manufacture. These would normally incorporate only one colour and be a smaller size with a simple indication of the different denominations. In given high visibility tournaments such as the WSOP specific casino chips are often used which are of equal quality to regular casino chips. A number of casinos have taken the decision to embed their casino chips with RFID microchips, in the aim to prevent counterfeiting and track gambler betting habits and amounts. Some question the profitability and usefulness of chipping casino chips due to the extra manufacturing costs incurred.